Jordi Muñoz lives in CaliBaja, a binational metropolis that San Diego and Tijuana want to put on the map. 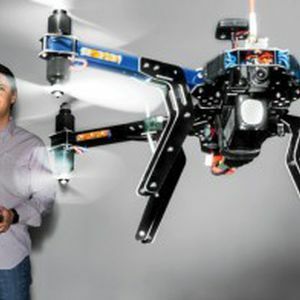 A Mexican native with permanent resident status in the U.S., the 28-year-old is the co-founder of North America’s largest drone manufacturer, 3D Robotics Inc. Its aerial vehicles are designed in a San Diego office building and get their wings in a Tijuana factory where Muñoz’s childhood friend, Guillermo Romero, supervises a workforce of 115. Engineers from both countries shuttle between the two locations. Like many people in California’s second-largest city, Muñoz sees the border more as an inconvenience than a barrier. Businesses are taking the same view. The region has a $230 billion economy that boosters tout as a rival to the pairing of innovation and cheap labor in Asia. “We’re going to convince the world that it’s better to invest in San Diego and Tijuana than China or India,” said Jorge Astiazarán, a physician and mayor of Tijuana since 2013. U.S. companies still outsource to Tijuana’s assembly plants, as they have since the North American Free Trade Agreement 21 years ago. What’s new is that Tijuana has grown into a center for engineering and specialized manufacturing. CaliBaja covers more than 28,000 square miles -- metropolitan San Diego, California’s Imperial Valley and Mexico’s Baja California. The area was part of Mexico before the Treaty of Guadalupe Hidalgo ended the Mexican-American War in 1848 by ceding California to the U.S.
For decades, San Diego’s ties to the military -- it has the West Coast’s largest Navy base -- overshadowed any relationship with Mexico, making it easy to ignore what was happening to the south, Cafferty said. Tijuana was long notorious for violent drug gangs and booze-soaked visits by day-tripping Americans. The city of 1.3 million has started to shed that reputation. Today the region is represented by the CaliBaja Bi-National Mega-Region Initiative, a partnership of economic-development groups funded by government agencies in both countries and companies including Bank of America Corp., Wells Fargo & Co. and Wal-Mart Stores Inc.
A group delegation to Japan in November pitched engineering and manufacturing opportunities to Toyota Motor Corp. Trips are planned to Dubai and Qatar to promote the region to private-equity investors. Connected by three border crossings, including the world’s busiest at San Ysidro, San Diego and Tijuana have grown physically closer as infrastructure and processing improvements mean the average motorist can get through a checkpoint in about 30 minutes, down from more than two hours a year ago. Wait times also have decreased for the pedestrians who queue up all day long. It’s a night-and-day transition, with the San Diego side lightly developed, a mix of green fields and low-slung buildings in industrial parks, and the Tijuana side crammed with dense neighborhoods, some of them slums with plywood-roofed shacks abutting the fence. There will be another crossing later this year: Investors in San Diego and Tijuana are building a 525-foot bridge to whisk travelers across the border to and from Tijuana’s A.L. Rodríguez International Airport, making it a more convenient alternative to San Diego’s one-runway airport. The binational push comes as Republicans in Congress and President Barack Obama battle over his effort to expand programs that would allow some undocumented immigrants to live temporarily in the U.S. A judge ruled this month that Obama had overstepped his authority. That debate is playing out far from San Diego and Tijuana. Faulconer delivered part of his state of the city speech in January in Spanish and endorsed “efforts to overhaul our broken immigration system.” Astiazarán was in the audience. Faulconer, a Republican, has stopped short of backing Obama’s executive action -- but supports the concept of a pathway to citizenship for some in the U.S. illegally. In Tijuana, a new expertise is taking hold in clusters of audiovisual, wireless communications and medical businesses. Universities in Baja California, the state of 3.3 million that includes Tijuana, last year produced a record 2,407 engineers, more per capita than in the U.S.
“The best of the Mexican engineers are as good as any American,” said Olin Hyde, founder of Englue Inc., a data-analysis company he keeps headquartered in San Diego because of the skilled work force in and near Tijuana. Other companies -- including medical-device maker CareFusion Corp. and Cubic Corp., which designs combat-training systems -- also follow the 3D Robotics model. Because of its location, some 1,700 miles (2,800 kilometers) from the capital of Mexico City, Tijuana has a more entrepreneurial spirit than the rest of the country, said Manuel Rodriguez, a business consultant who headed the Tijuana Economic Development Corp. until January. Take risk-takers like Muñoz, whose psychiatrist father bought computer parts at San Diego swap meets and brought them back to Tijuana for his son. As an 8-year-old, Muñoz assembled components from a hobbyist rocket and a radio-controlled car to fashion a bomb that he detonated from afar with “massive” results. “I did it once, it was cool, and I never did it again,” he said. A decade later, Muñoz applied the same do-it-yourself ethos to fashioning the brains of his drones -- the autopilot that keeps the contraption stable -- from video-game components. He wrote about his work on blogs, where he was discovered by Chris Anderson, then the editor-in-chief of Wired magazine and a technology investor in Berkeley, California. The two teamed up to form 3D Robotics, with Anderson remaining in the Bay Area and Muñoz developing drones in his San Diego office, which has a pool table and views of the hills where he grew up. Outside the Tijuana factory, finished drones buzz around the concrete warehouses.